Aseem Trivedi is NOT a Cartoonist…He’s an activist. Wait a minute, there’s a difference between the two. A cartoonist, is like a journalist. He only brings the public attention to an issue. He’s apathetic to the issue. In short, he doesn’t appear Angry, disappointed or disillusioned by the problem he limns in the cartoon. An Activist, on contrary is neck deep into the problem or issue, that he is bringing to fore. 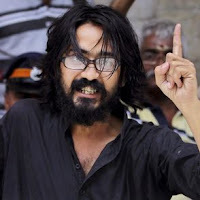 Aseem Trivedi is a member of India Against Corruption. So when he makes cartoons, his inner biases and anger seeps through to his renderings. They appear Angry, disillusioned, vicious. That are not the hallmark of a great cartoon. The first acid test of a great cartoon is the response “Wah” followed by a happy Smile. Many people will be surprised, but a Good cartoon, irrespective of the issue it takes, makes people happy. And happy people make for better thinkers. You put this test to Aseem Trivedi’s cartoons, they look angry and biased. And courtesy this anger, many a times they fail to convey their message. And while seeing them, you feel angry too. Sometimes Anger is for the disagreement with the cartoon; sometimes it’s for the support for Aseem’s cause. But a cartoonist shouldn’t have a cause of his own. What Aseem Trivedi is making, are staple diet to any protest (Right wing, left wing, State Agitation movements etc.). I have been witness to Uttarakhand State Agitation in 1990s. ‘Aseem Trivedi like renderings’ were a common sight during that agitation as well. At that time, activists used to draw “Parliament Tolet”, “A Dog peeing on the Parliament”, “Woman running with slippers in hand after some politician” posters for every rally, dharna and protest. Such posters got people talking in the venues and got praise from them. But they were surely not the “Cartoons”. They were simply meant to mobilize crowds for the cause. When Uttarakhand was created; many of these activists were arrested for anti-state activities (sedation charges as well). Calling Aseem Trivedi a cartoonist is an over the board reaction. He’s an activist, who gives a damn to the principles of cartooning. That’s why his cartoons are seeing sedation charges. A Cartoonist, seldom finds himself in such a situation. As he knows, cartooning is an apathetic art, to make people swallow bitterest of pills Happily.